BattleTechnology (subtitle: The Magazine of Combat in the 31st Century) was a magazine dedicated to the BattleTech franchise. Intended as a bi-monthly magazine, 21 regular and 2 special editions were published between 1987 and 1995 in 8.5" x 11" format, with usually 60 pages per (regular) issue. The first twelve issues are collectively known as "The War Years", while issues #13 through #21 are collectively known as "The Time of the Clans". Separate binders are available. The magazine was largely written from an in-universe perspective, featuring news coverage, reports and essays on "current" events complete with advertisement pages from fictional in-universe firms. Other than that, the magazine offered game scenarios for BattleTech-based tabletop combat and roleplaying games, optional rules, general background information and artwork. Fans generally hold the magazine in high esteem, especially the early issues. The current definition of Canon for BattleTech universe as laid down by then-Line Developer Herbert A. Beas II in 2008 expressly excludes magazines (even "official" ones like BattleTechnology). Content from official BattleTech magazines is therefore considered apocryphal by default. However, it is worth nothing that BattleTechnology was originally considered full canon. Author and game developer Jordan Weisman expressly included it among the background sources for the franchise when prompted in a 1988 interview, and the magazine is also listed on an advertisement page in several BattleTech products. BattleTechnology's initial editor and chief contributor, William H. Keith jr., was the author of the first BattleTech novel (as well as the third and fourth), and other contributors to the magazine were also heavily involved in the creation of official game material. As a result, the magazine tied in very well with the ongoing evolution of the universe and sometimes even included background material that had been used by the writers, but never published elsewhere. The (or a) BattleTechnology magazine canonically exists within the BattleTech universe: Text boxes on pp. 13, 14 in the DropShips and JumpShips document are captioned as "Excerpt from Battle Technology by M.A. Bozulich, Donnel, Sephus, and Barrow Publishing, 2831". BattleTechnology is mentioned by name in the novel The Dying Time in chapter 6, where a character sees a 'Mech that he had "never seen outside of BattleTechnology magazine and intelligence briefings" as of 3065. This has no bearing on the canon status of the (real-world) magazine, however, and confirms neither the canonicy nor veracity of the magazine's content for BattleTech. A lightning strike by the 2nd Kearny Highlanders spearheaded a snap raid by Liao forces onto the Davion world of Corella early in July, culminating in the Battle of Kilgour. Critics of Prince Hanse Davion's policies contend that the war games and maneuvers recently launched are wasteful of precious war materials and risk triggering confrontations such as Kilgour. See page 16 of this issue, "What is Hanse up to?" This month's cover captures a moment of raw terror—Captain Addison's Thunderbolt under 'Mech-to-'Mech attack by a Davion Marauder at the Battle of Hill 091, on Scheat V, in August of this year. Captain Addison's own story is featured in this issue. See page 26, "A Dagger's Death." This issue's cover shows a critical moment in a recent AeroSpace Fighter dogfight over the Steiner world of Wyatt. Lieutenant Kensie Shaneyfelt, of the 10th Skye Rangers Aerospace Division, maneuvers his Corsair to avoid an attacking Slayer, piloted by Major Dmitri Pawoloski, Marik 4th Division of the Defenders of Andarien. [sic] Details of this encounter may be found in The Fifth Kill on page 28 of this issue. It's Hovertanks against BattleMechs as a 31st-century Light Brigade charges into the Valley of Death. The cover shows Captain Verna LeMann of the Royal Grays cavalry militia during her charge against Kurita heavies at Harmony Pass. The engagement is described in this issue's BattleTips on page 12. The Banner of Young Davion – Traditional to the tune of "The Bonnets of Bonnie Dundee"
This issue's cover captures the final moments of a scratch battalion of the 2nd Kearny Highlanders in the tangle of Mira's equatorial jungles. Liao forces found more than they'd bargained for during a reconnaissance in force on the Davion-held border world. The encounter is featured in "Howl of the North Wind" on page 30. Subtitle: WAR!, in-universe date: September 3028. The War is on, with a massive Davion invasion of nine systems across Liao space. The cover shows the fighting near an archeological site on St. Andre's Ivaar Wastes where the Davion Light Guards' Delta Company squared off against the formidable Cochraine's Goliaths. Home for Christmas: A Special Report: How Long the War? Report from the Front: Special reports on the warriors and worlds in the news. BattleTechnology takes you where the action is. This issue—Aldebaran, St. Andre, Algol. Subtitle: Hanse Davion's New Mech?, in-universe date: December 3028. 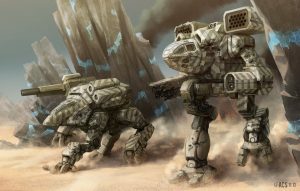 Our representative on Luthien has received this picture, taken by ISF intelligence sources, of the ALI-1A Alliance, the so-called "Davion Terror-'Mech". The picture was taken during night desert trials on an undisclosed planet. The pilot is said to be "Fox-Prince, Hanse Davion, himself". No confirmation of the pictures has been possible. Subtitle: Kurita Slays Steiner, in-universe date: September 3029. This issue's cover features a Patton tank taken two years ago during Spring training on the then-Liao, now-Davion world of Second Try. It may be the tank mentioned in Blood in the Snow, page 16. Subtitle: War Over, in-universe date: March 3030. Subtitle: Janos Marik Slain, in-universe date: December 3035. A 'Mech drop, ablative coating burning off as the 'Mech falls through the atmosphere of Alcyone. Subtitle: Kurita Wins a War, in-universe date: January 3040. BattleTechnology Photographer Marty Bingham caught this shot just after dawn on June 15, 3040 in the Alberta Hills of New Mendham as a Kurita Mechwarrior prepared for battle. Subtitle: Silence From the Periphery?, in-universe date: February 3046. "Target Acquisition — Mech's Eye View"
In The News: Silence from the Periphery? Subtitle: Mystery Attackers!, in-universe date: Year-End 3049. Subtitle: What Hit Us?, in-universe date: May 3050. News From the Front: Inner Sphere Invaded!! Subtitle: Princes in Peril! - Story on page 8, in-universe date: August 3050. This issue's cover features a 'Mech from the Ghost Bears, taken by Combat photgrapher Steve Venters during the invasion of Schuyler, June, 3050. This Clan 'Mech is tentatively titled a 'Mad Cat' by Inner Sphere combatants. Subtitle: Rasalhague Falls!, in-universe date: December 3050. Subtitle: Who ARE they?, in-universe date: June 3051. Subtitle: In Trouble NOW!, in-universe date: January 3052. Subtitle: TRUCE!, in-universe date: May-June 3052. Subtitle: Up To Our Necks, in-universe date: July 3053. Subtitle: The Dragon Dies, in-universe date: December 3054. This Special Edition ran for 80 pages; additionally, it includes a complete reprint of issue #1 (0101) as a special bonus section in the middle. According to the "Opening Shots" introduction by Hilary Ayer (from Tharkad, May 3051), the "Lost Issues" cover the time period between the Fourth Succession War and 3050. BattleTechnology takes this opportunity to thank Sgt Laura Martinez, formerly of Scout Lance, 3rd Co, Mirsham's Battalion, for the information and personal mementos that gave us our inside coverage of Galtor's own 3039 war. Although Galtor III saw her unit destroyed, Sgt Martinez has made a new career for herself in the Magistracy of Canopus, where she is a member of the Magestrix' personal defense force. Her husband, former Mirsham's pilot Julian Warlock is head Trainer-in-Residence for the Magestrix' Aerospace Forces. This picture of Sgt Martinez was taken just before Mirsham's Battalion left for Galtor III. Another 80-page special edition cover on the early 31st century in retrospective, specifically of the year 3013 and further coverage of the War of 3039. The defining event of the first half of the 31st Century was the Third Battle for Mallory's World. On October 21, 3013, First Prince Ian Davion was killed in action against Kurita invaders (back cover), giving Hanse Davion the leadership of the Federated Suns and changing the face of Inner Sphere politics. Digital Recreationist Frederic Kuramura commemorates Hanse's ascension with his depiction of the first skirmish: Opening Shots. ↑ BattleTechnology is advertised among other (fully canonical) BattleTech products in the back of the Sorenson's Sabres scenario pack, for example, inviting the reader to "Explore the BattleTech universe with these fine products"
This page was last edited on 28 March 2019, at 20:51.